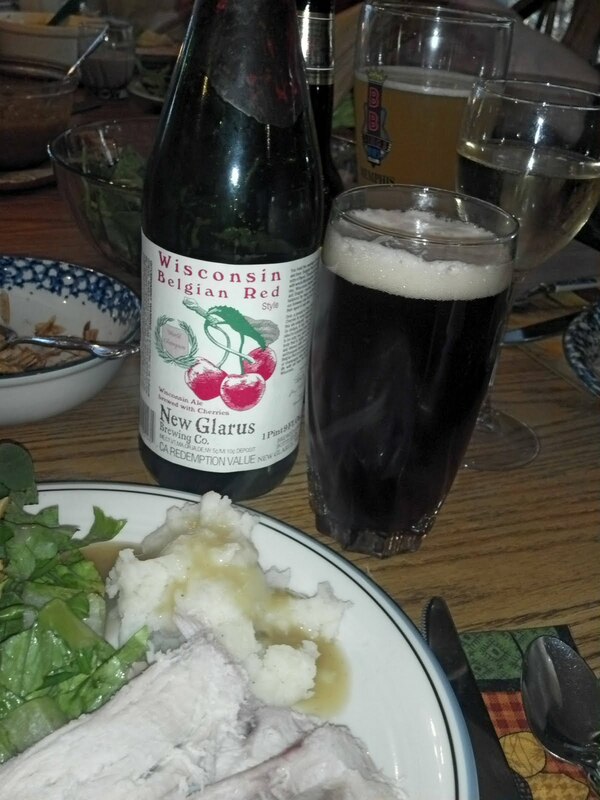 We visited my sister in Wisconsin for Thanksgiving. My sister was nice enough to go out and get a couple of beers for me to check off my "Best Beers in America List". On Thanksgiving itself, I had the New Glarus Wisconsin Belgium Red. This beer was tied for #16 on the list, and I've been trying to get some since last year's list. Since New Glarus doesn't distribute to Colorado, and they didn't bring this beer to GABF, I am lucky to have family living in Wisconsin who were willing to help me get this beer. And I really enjoyed it with my Thanksgiving dinner. No one else at the table was much of a fan, which was fine since it meant I could have most of it. Both the aroma and flavor were full of cherry, but it had a nice Belgium malt backbone with nice funky notes from the yeast. This beer was indeed worthy of the list. It isn't something I would want to drink everyday, but it is nice for special occasions. My sister was also kind enough to pick up Founder's Breakfast Stout (another beer that doesn't come to Colorado). This beer is tied for #3 on the list. It was a nice beer to drink, but I am sure I would not put it on my own personal list. It has lots of dark roast flavor. It has a noticeable "hot" alcohol flavor. 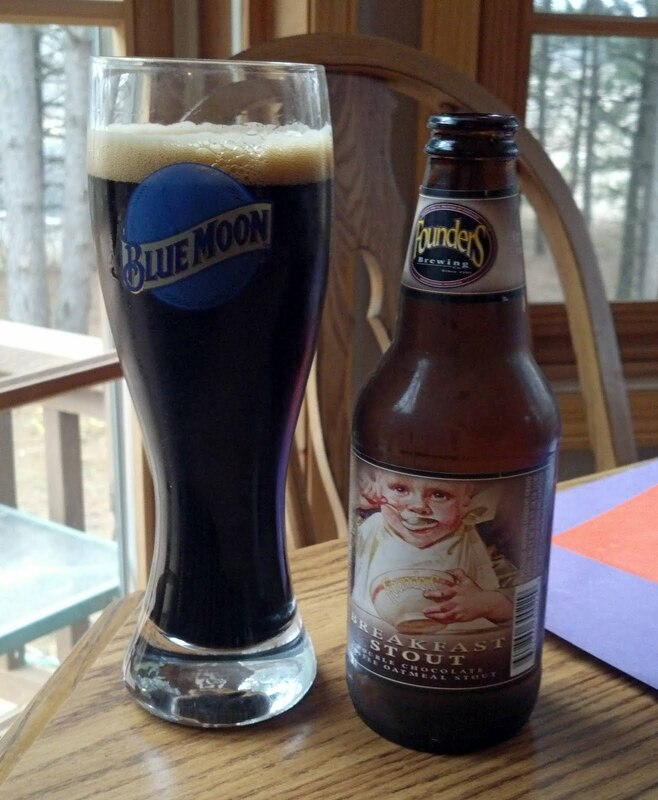 I have other stouts that I prefer. I am glad to have marked it off my list, though. So, now, (if I am counting correctly) I have had 9 of the top 10 beers on the list and 36 of the 52 beers on the list. Personally, I think 69% is outstanding for this particular goal. I'll continue to look for the rest of the beers when I have a chance. Most of the beers left on the list are not distributed in Colorado. 5. Bell’s Hopslam ... my sister tried hard to find this one, but it was not to be. 12. Sierra Nevada Bigfoot Barleywine ... limited selection. not sure if I will find this in CO.
T16. Dogfish Head 60 Minute IPA ... year round beer. Should be able to find in CO.
19. Bell’s Expedition Stout ... doesn't distribute to CO. Should have had my sister look for this. T20. Samuel Adams Noble Pils... spring seasonal that I should be able to find in CO.
T20. Surly Furious ... I should have made an effort to get this while in MN. T20. Troegs Nugget Nectar ... PA brewery. Can't get in CO.
T34. Avery Maharaja ... CO beer that I'll have to look for in the spring. T34. Dogfish Head Indian Brown ... year round. Might be able to find in CO.
T34. Three Floyds Gumballhead ... don't even see this beer on their website. T43. Russian River Blind Pig ... not sure if I will be able to get this in CO.
T48. Dark Horse Crooked Tree ... Midwest distribution only. T48. Summit EPA ... Another MN beer I should have had my sister look for. 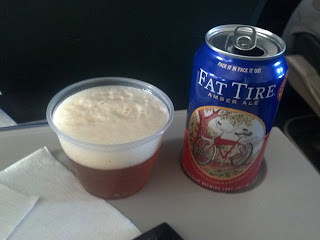 This is the first time I have flown Frontier Airlines since they started serving Fat Tire on their flights. It was so nice to have more choice than BMC light beers. 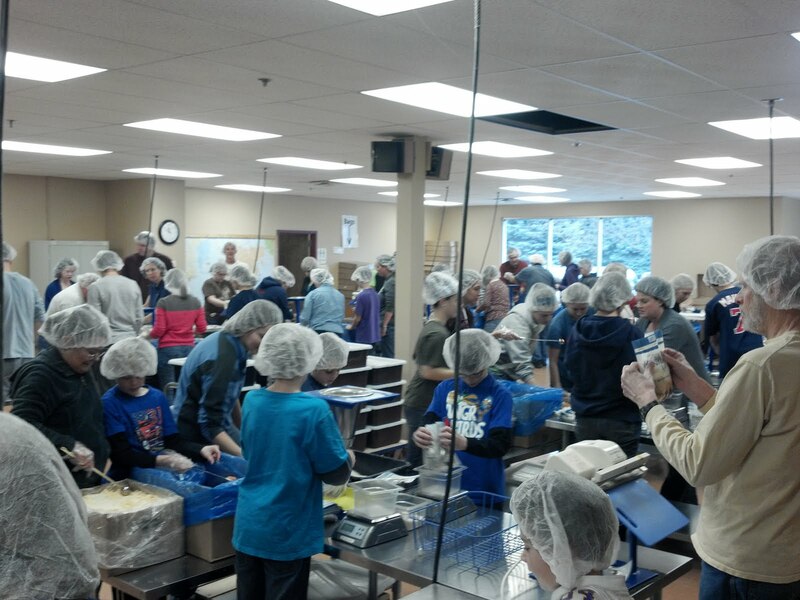 Good for Frontier! We did lots of non-beer related things in Wisconsin. I'll refer you to My Sister's Blog for more details on that. We had a wonderful few days. Thanks to my sister and her wonderful hospitality. If you want to trade some beer let me know. I can get Three Floyds pretty easy here (except Dark Lord). I can also get Bell's Hopslam in the spring and the SN Bigfoot I've seen a couple times. Yup, I did see Bell's Expedition Stout and most likely the Summit. How long are you giving yourself? Maybe we'll finally take the long drive next summer. Scott, I might have to take you up on that. Are there any Colorado beers you have your eyes on? Scarlet, I'm giving myself until the next Zymurgy list comes out. This year that was late June. Last year, I only got to 25 of the list, so I am happy with 36 even if I don't get any more. The "Craft Beer on the plane" picture was used (with permission) on this web page: Amerikaanse vliegtuigmaatschappijen introduceren ‘Craft Beer’ tijdens de vlucht. I can't read Dutch, but I'm sure it is a great article.